Sixty years ago the U.S Naval Research Laboratory (NRL) launched what has become the longest remaining man-made object in space. 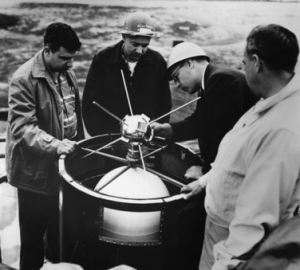 Launched March 17, 1958, Vanguard I, a component of the Vanguard Project, is a small aluminum sphere (16.5 cm in diameter) that was designed to partake in the International Geophysical Year (IGY) — a series of coordinated observations of various geophysical phenomena during solar maximum, spanning July 1957 through December 1958. Following the unexpected launches of two Earth-orbiting satellites, Sputnik I and II, by the Soviet Union, and following a series of NRL’s own suborbital tests with the prior launches of test vehicles (TV) zero, one and two, NRL, set out to launch the first Vanguard satellite (TV3) into orbit, December 6, 1957. The launch however suffered a launch system failure and crashed on the launch pad in a fiery explosion. Despite this unfortunate setback, the Vanguard Project had still come a long way toward solving the problems of putting a satellite into orbit. This proved a valuable asset to U.S. engineers and researchers and was an enabling factor that contributed to the successful launch of the U.S. Army’s Explorer I, January 31, 1958, the first U.S. satellite placed in Earth orbit. Three months later, on March 17, NRL successfully launched Vanguard I, becoming the second U.S. satellite in Earth orbit and attaining the highest apogee of any satellite, an altitude of nearly 2,500 miles. With the launch of Vanguard I, the NRL Vanguard Project had finally begun to see many of the mission goals come to fruition, to include testing of three-stage launch vehicles, establishing a network of terrestrial tracking stations known as ‘Minitrack,’ and measuring the effects of the space environment on an Earth-orbiting satellite. Vanguard’s orbital data proved invaluable toward the understanding of upper atmospheric physics, geodesy, geodynamics, solar terrestrial relationships, dynamical astronomy, and exospheric structure. Additionally, Vanguard I returned a wealth of information on air density, temperature ranges and micrometeorite impacts as well as revealing that the earth is slightly pear-shaped rather than round. Instrumentation onboard Vanguard I included a set of mercury batteries, a 108-MHz transmitter, two temperature sensors, and a Minitrack beacon powered by six square solar cells – the first satellite on-orbit to be powered by photovoltaic cells. On-board transmitters were used primarily for engineering and tracking data, but were also used to determine the total electron content between the satellite and ground stations. Although the satellite’s batteries lasted only 20 days, the crystal silicon photovoltaic, or solar cells, developed by the Army Corps of Engineers, continued to provide power for another seven years. With the signing of the National Aeronautics and Space Act, by president Dwight D. Eisenhower, the National Aeronautics and Space Administration (NASA) was formed. By way of presidential order 10783, NRL’s Vanguard Project civil service personnel were transferred into the newly created administration on October 1, 1958, and became the “nucleus” of the Goddard Space Flight Center. Although data transmissions fell silent in 1964, ground-based tracking of Vanguard I has continued to provide scientists with data concerning the effects of the sun, moon and the atmosphere on satellite orbits. 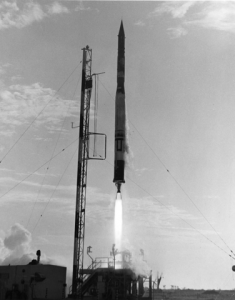 With a present apogee and perigee virtually unchanged from initial launch, Vanguard I, and subsequent satellites Vanguard II (Feb. 1959) and III (Sept. 1959), are all destined to continue to orbit the Earth and provide atmospheric and environmental data sets for well over another 60 years.